What are you looking up here for? I got the book from the library. There are about 14 books in this mystery series and I read them all! I also got this great game called 10 Days In Europe. You have to start with a country and end with a country. Say you start with Belgium. You can walk to any border country of Belgium. Say you start with Belgium again. And you have a yellow plane. You can fly to any country with the same color. Say you have England. And you have the Atlantic ocean. You can take a boat to a country touching the Atlantic ocean. 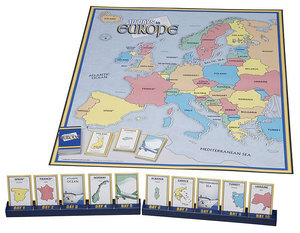 If you play this game you will definitively learn European geography!